Stevie Roden: Stevie Roden - Rookie of the Year? I can see it now, Stevie Roden - Rookie Champ 2009. Medal wrapped around my neck, maybe even the national anthem. Hang on, I am getting carried away a little bit. It is just this Sunday will see me compete in my third Sprint Triathlon - this time in Macclesfield. 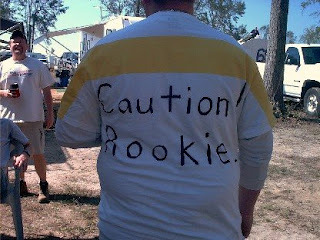 But I noticed the first person back out of the first-year competitors will be crowned the rookie champ. A chance to really put myself to the test. Rather than flagging down near towards the 200th finisher, I could have something to aim for over the 400m swim, near 26k bike ride and 7.2k run. Training has been going well and I have finally got my hands on a road bike. An old mate of mine, going back years, has popped up to team up as my training partner when he is free. And Phil Ashmore has come to the rescue by letting me borrow his gleaming yellow road bike. It is the real deal. Now, I have mentioned in the past how much quicker I could go on this. It could shave a few minutes off my time. And practice has gone well. The real test will come in Macclesfield. So, a better, more purpose-built bike over the bulk of the course will stand me in good stead. Rookie champ it is then. Well, a quick look at the times of the Rookie winners from the past two years made it clear. I should dream on. It appears, looking at their times, I would need a propeller on by back in the pool and not just a road bike but two wheels that are powered by petrol. And as for the run, maybe a pair of roller blades? If I wanted such a title, to get into that kind of shape I think I would have to quit work and train full time! I should forget Rookie of Macclesfield. Instead, I should concentrate on just staying awake. An 8.05am start time means getting up at 5.15am on Sunday morning. Forget Rookie champ, rising at that time at a weekend will be an even bigger accomplishment.